Have YOU ever wanted to paint on Glass? NOW You can join Pixie the second Tuesday of each month at SNEAKERS Restaurant and Grill in Jacksonville Beach ( same night at Art Walk) Time is 6:30 p.m. till 8:30 p.m. Cost is $35 pp, includes 2 wine glasses or vase to paint, all paints, brushes etc. Reservations recommended, Walk ups accommodated according to space. Call Pixie at 904.710.8682 to reserve your spot today! May 8th, June 12th, July 10th, August 14th, September 11th, October 9th and December 11th. 1) Pixie will travel to outlying areas of Jacksonville: Middleburg, Fernandina, St. Mary's GA., Daytona and Ormond Beach. 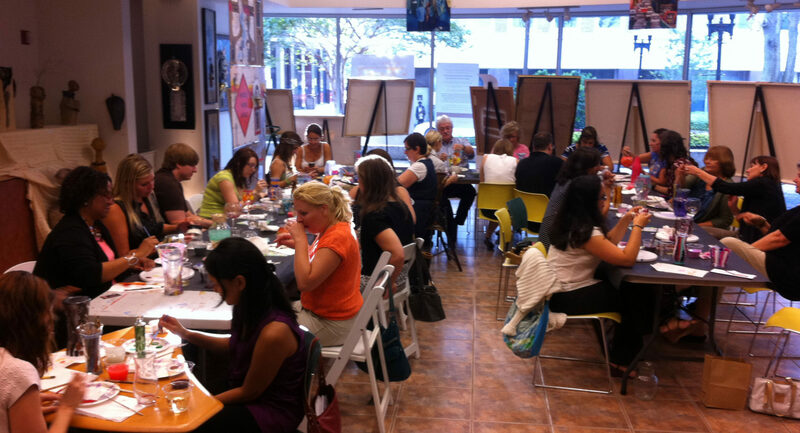 2) Join Pixie in her Neptune Beach Studio, small private groups or one-on-one painting time is available. 3) Give the gift of Creativity. Gift Certificates for Glas Clas's are always available. Contact me and I will email a certificate to you. Painting on glass is therapeutic, relaxing and most of all FUN! 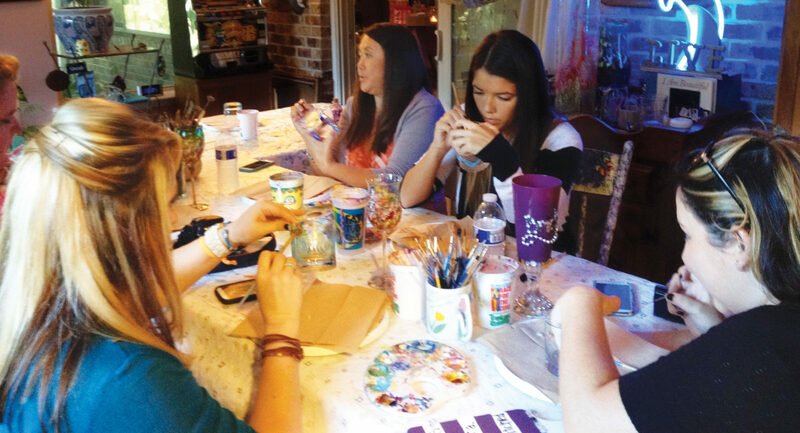 Whether a Girl's Night Out, Bridal Shower, Birthday Celebration, Book Club activity, Country Club event or any other occasion, a Glas Clas™ with Pixie offers each individual the opportunity to tap into their own Creative Spirit and FUNctional art at the end of the event. Glas Clas™ is $35 per person for a 90 minute class and include a practice piece (for you to get the feel of the paints), two wine glasses or a vase. Check out my video below and call me to schedule YOUR Glas Clas™ today! My sorority alumnae group did a Glas Clas with Pixie right before the holidays. 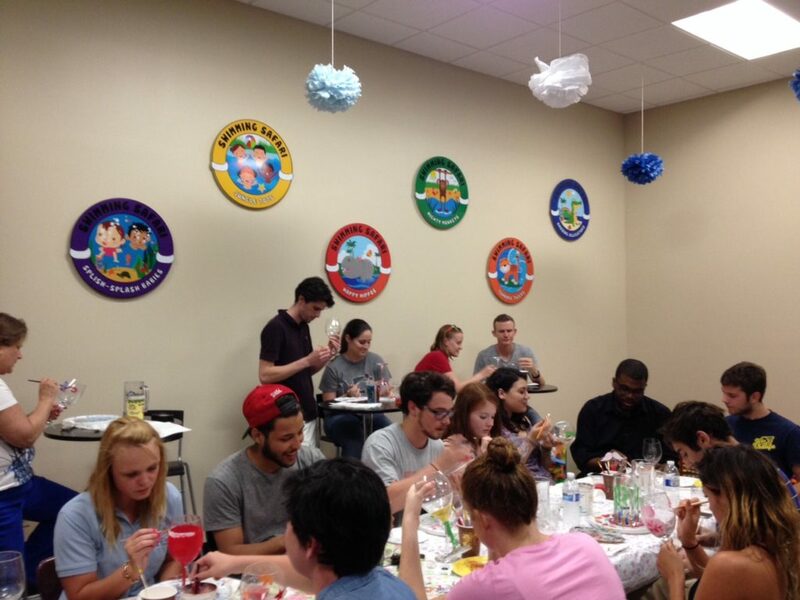 It was a fun social event, and we all left with adorable gifts in hand. Pixie is a talented artist and a gifted leader. Definitely go – you will uncover some artistic talents that you didn’t know you had! A delightfully creative evening with my Soul Sisters! Painting glass was a new endeavor for me. Trust me, I am not an artist. I loved the class. More importantly, I loved the chance to simply be creative and have fun. I painted two glasses while slightly embarrassed and afraid of the outcome. I love them so much they are placed next to my wedding pieces with my fine china. Thanks Pixie for helping me to step out of my comfort zone. I took a client with me for a fun day of " outside the box" activities & we both just loved it! I have been back quite a few times as it truly makes me feel calm and peaceful just being in a creative mindset! Took my husband and we had a great night of fun, as well!! Glas Clas is a blast!! Thanks, Pixie!! Pixie and her assistant for the night were absolutely incredible. With 43 ladies all mixing and mingling they did an amazing job with making sure they all had any materials they wanted and instruction to help them all move forward with their individual projects. Pixie did a few samples and gave them away as prizes, which the ladies loved as well. Pixie was very flexible with the setup and made adjustments when she arrived that would better suite the set up and the amount of ladies that were attending. We are so grateful for a professional business woman who is so adaptable and accommodating. This style of entertainment is perfect for a Country Club setting. Everybody knows everybody and they are able to come in and enjoy a fun filled, affordable evening that they can’t find anywhere else. Pixieglas™ Glas Clas™ is truly one of a kind!